We just can’t get enough of smoothies! We.enjoy.them.very.much! They are fast, super easy, and anyone can make one! One great thing about smoothies is you can pretty much throw anything in! I love making smoothies when I have bits and pieces of fruit that need used up, and used up quickly. I tossed this recipe together while cleaning out my fridge this morning. The best thing about this smoothie is it has only natural sugars. Enjoy this healthy treat! In a blender, combine milk, banana, berries, and yogurt. Add ice-cubes and blend until smooth. Pour into glasses and serve. Makes 8 – 1 cup servings. 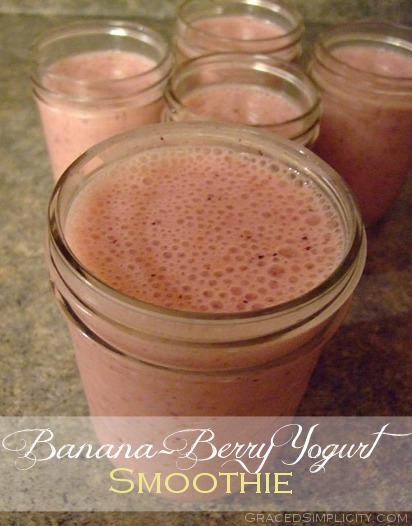 Do you have a favorite smoothie recipe? Please share!